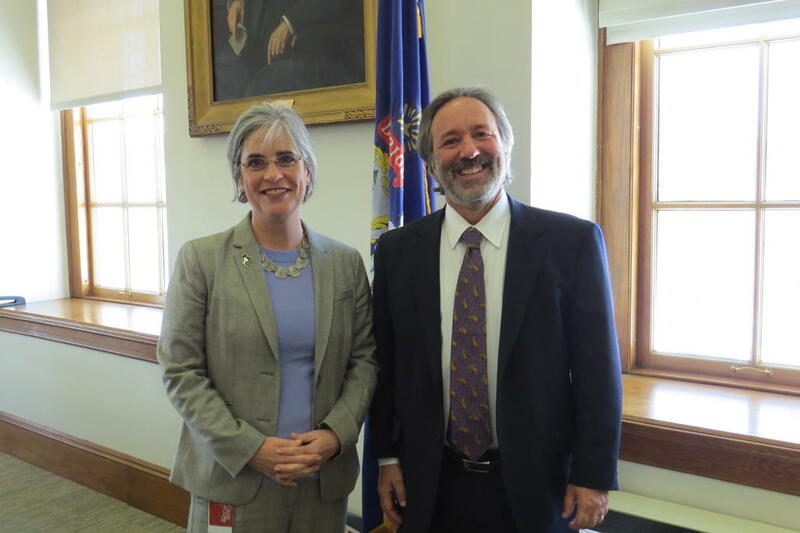 AUGUSTA — Two legislators representing Westbrook, the co-chairs of the joint committee that reviews the proposed state budget, are taking a new and “transparent” approach to state spending. Sen. Cathy Breen and Rep. Drew Gattine, Democratic co-chairmen of the Joint Standing Committee on Appropriations and Financial Affairs, are scheduling office hours to meet with the public about budget priorities before the governor submits her biennial spending proposal next month. “We have some time as we wait for the governor to present her budget. We have some time now to just hear from people all over the state about their priorities,” said Breen, who represents Senate District 25, which covers part of Westbrook and all of Gray, Cumberland, Falmouth, Yarmouth, Long Island and Chebeague Island. “I think it is a great idea and something not done before,” said Gattine, who is in his second year co-chairing the committee. Breen, a committee member last year, and is in her first year as co-chairman. Gattine expects to hear concerns about health care, local property tax, revenue sharing and school funding. Both Breen and Gattine hope their office hours are the start of a more transparent budget process. “Without looking back too much, we as a Legislature have had a hard time working with the previous administration regarding how money was being spent. There wasn’t a lot of transparency. Within this administration, that will be different. There will be a lot more transparency,” Breen said. Once Mills unveils her budget – the deadline to do so is Feb. 8 – the Joint Committee on Appropriations and Fiscal Affairs will hold public hearings throughout February and March. Breen said those hearings may roll into April, which was the case in 2011 when Gov. Paul LePage, then just starting his first term, presented his first biennial budget. The budget needs to be in place by the time fiscal year 2020 begins July 1. How the Joint Committee on Appropriations and Fiscal Affairs moves forward with their recommendations, Gattine said, will depend on what comes out of the office hour sessions and other conversations with the public, along with the priorities of the governor and legislative committees. Mainers can sign up to meet with Gattine and Breen in Augusta for appointments of up to 30 minutes on Monday, Jan. 28, from 1 to 4 p.m. and Wednesday, Jan. 30, from 8:30 to 11:30 a.m. Contact Patrick Rankin at 287-1532 or patrick.rankin@legislature.maine.gov to make an appointment. Sen. Cathy Breen and Rep. Drew Gattine, co-chairs of the Joint Standing Committee on Appropriations and Financial Affairs, are holding office hours in Augusta so the public can share their budget concerns and priorities.